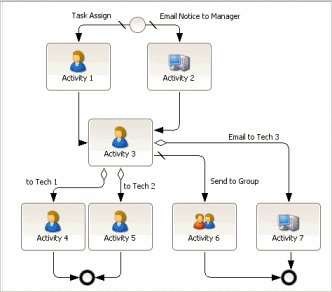 You can add multiple incoming links to worksteps, as shown in Activity 3 in Figure 1. You can also add multiple incoming links to Decision, Or-Join and End worksteps. These multiple incoming links are the equivalent of an Or-Join shape and, in this case, indicates that Activity 3 will be performed when either Activity 1 or Activity 2 is completed.